Official Google India Blog: Doodle 4 Google 2013: Your Doodle on the Google homepage! Doodle 4 Google 2013: Your Doodle on the Google homepage! If you’re a fan of the Google Doodle and love the way Google has fun with its logo then here’s your chance to showcase your creativity and get your doodle on Google India’s Homepage on Children’s Day, November 14th 2013. With the launch of 5th Annual Doodle 4 Google Contest, we invite bright young minds of India to send in their creative, aesthetic and innovative Doodles based on the theme ‘Celebrating Indian Women’. The contest is open for children from ages 5-16 (Class 1st to 10th ) to put on their thinking hats, get out their colors and get creative with the Google logo. Let your imagination flow and bring alive the multiple facets of Indian Women and her contribution to the society, the country and to people’s life. Last year, we asked young doodlers across India to describe India’s Unity in Diversity. With a combination of sports, , unique folk culture, extraordinary remarkable handicrafts, wide range of flora and fauna; Arun Kumar Yadav from Kendriya Vidyalya, Chandigarh made this winning doodle. Participating in Doodle4Google 2013 is simple! Just visit www.google.co.in/doodle4google, download the form, doodle and submit it. Just make sure your entries reach us by October, 28 2013. We’ll also be visiting a few hundred schools in 12 cities across India to collect your entries, so watch out for the Google team! 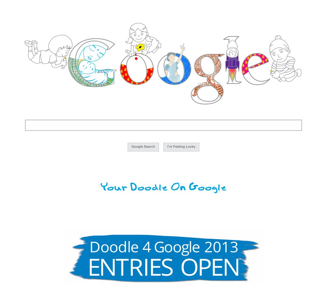 Finalists will be invited to Delhi for an exclusive event on 12th November 2013 where the Winner of the Doodle 4 Google 2013 will be announced and awarded. And, if you are a teacher, parent, uncle or elder sibling reading this, its time to tell the little one’s about doodle4google, help them with downloading the form and submitting it.